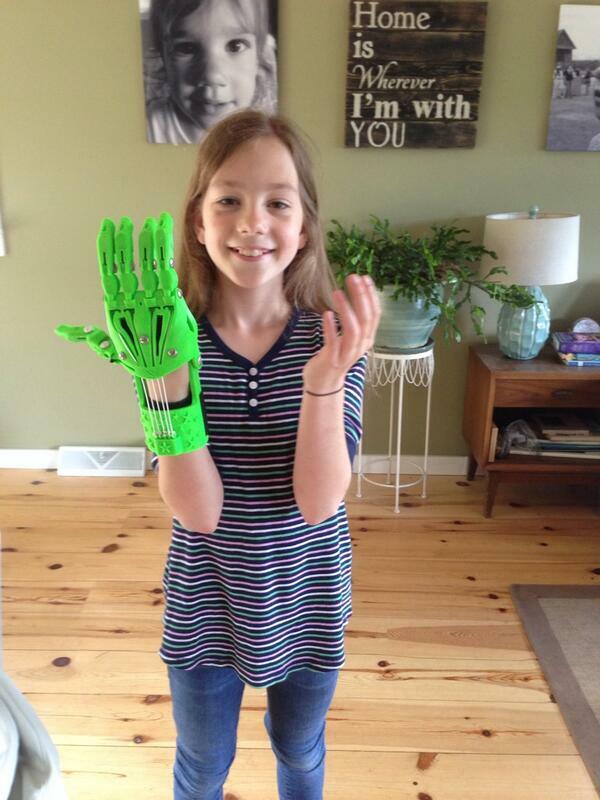 Sierra with the 3D printed pieces and assembly materials for an e-NABLE hand. For background, see e-NABLing Sierra – Part 1. I’m so impressed with Sierra! I sent her a bunch of 3D printed pieces and some assembly materials and she was able to assemble a fully-functional mechanical hand prosthesis. Sierra has already caught the attention of Ed Tech, who wants to interview her, and the science fair hasn’t even taken place yet. Her classmates have been excited to hear stories of her work, so this Thursday, I’ll be doing a Skype call with her whole class to talk about 3D printing and the kind of work Sierra and I are doing. And of course, stories and photos of her work are being shared on the Internet. Now, think about the downstream effects of all this. Sierra is going to be reaching thousands of people – sending a strong message about how powerful this technology is. An affordable technology that allows a 10-year-old to do something that used to require a big company and millions of dollars in R&D and manufacturing costs is a really big deal, and Sierra is helping to spread the word. For that, I am truly grateful to her.